Modern Dresdens create a path across this quilt top, making a big impact. This is a fun project for confident beginners/intermediate students. 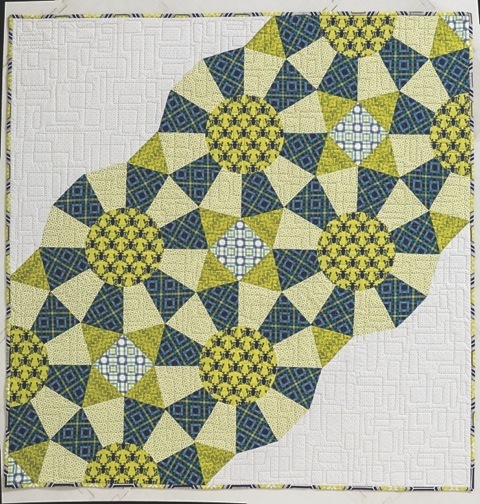 This class will focus on teaching interesting piecing techniques, as well as fusible appliqué, preparing block sections, and machine appliqué. Background preparation, thread choices, and helpful tips on making this a fun experience will round out the agenda. Students will learn all the skills needed to complete the full project. 3 hours. The students will learn all the techniques needed for the quilt while completing two columns of the quilt. They are responsible for finishing the remainder of the quilt at home. Tip: class will proceed more smoothly if templates are provided for students. If not provided, add 1 hour to class time. Each student will need a sewing and cutting area, access to an iron and ironing board, and space for a design wall. Refer to pp. 68–73 for instructions. Patterns for templates are included in the pullout pages of the book. Refer to pp. 5–13 for basic information on techniques and materials. 1. Discuss materials and process for fusible-web appliqué. 2. Discuss process of making templates. 3. Make all pieces needed for two columns from templates. 4. Sew Dresdens into circles and half-circles. Prepare centers, fuse, and machine appliqué. 5. Sew into columns. Join columns together. 6. Discuss laying completed Dresden section on background and appliquéing. 7. Discuss preparing top for quilting.